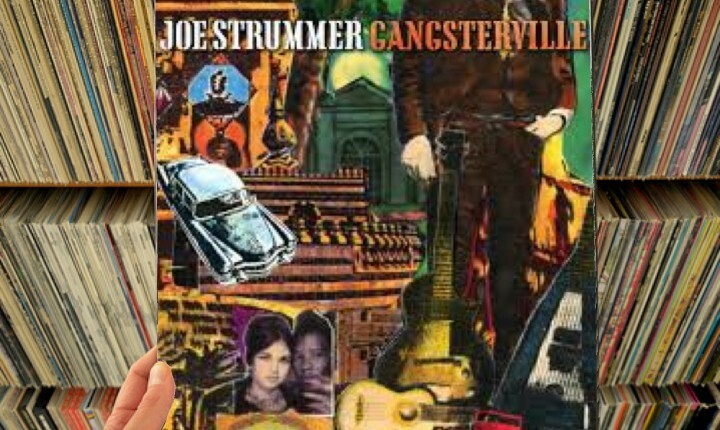 A deeper look at the grooves pressed into the “Gangsterville” single by Joe Strummer, being reissued for Record Store Day 2016! With the benefit of hindsight, the first thing listeners will notice about this single’s title track is how well it dovetails with the final days of The Clash, and where they were when the wheels finally fell off with Combat Rock in 1982 [this critic does not recognize Cut The Crap as a real Clash album because it was, well, crappy â€“ed]. Here, Strummer lays out his frustration at being dubbed the man that every fan seemed to be counting on to continue being the â€œmember who mattersâ€ after the dissolution of The Clash (check out lines like â€œThe Revolution came and the Revolution went/ The chemical rain left the message on the tent/ Wanted: one man to lead a crusade/ Payment: a bullet on a big paradeâ€ for a clear clue), and sets those sentiments up alongside a defiantly meticulous, sparkling and generally cheery-sounding musical composition. Simply said, â€œGangstervilleâ€ is a good song which is really easy to like. While not as obviously â€œClash-yâ€ as that first shot, the ‘other’ song on the A-side of this single, â€œPunk Rock Blues,â€ boldly steps out of line and reaches for a very romantic tone which is striking â€“ especially stacked as it is with â€œGangsterville.â€ Now, to be fair, the song isn’t the single easiest one to understand that Strummer ever recorded, but the emotional angle it’s reaching for is simple to understand thanks to Strummer’s warm croon and listeners will find it easy to love even if it isn’t the single easiest song to understand. It does need to be said that â€œCholo Vestâ€ is the definition of a B-side. While the song is slow (some might call it a ballad), that it takes about two minutes for Strummer to open his mouth and really begin the song is pushing the limits of excess for an artist who was once in a punk band (some might say the punk band â€“ or the only band that matters), and it will have listeners seriously considering a move to lift the needle. That thought gets dropped the second those all-important lyrics do kick in though, and listeners discover a level of candor and thoughtfulness which is absolutely knee-buckling and will cause them to know they should pay close attention. Sour thoughts about the possibility of going out with a whimper rather than a bang (â€œNobody really thinks about you when you’re goneâ€) as well as moments questioning if punk isn’t dead and all that was left in 1989 was just a charade (â€œAnd even the screaming monsters with the armband and the studs/ Gonna rock down in Anaheim/ You know something, they don’t take it so seriouslyâ€) are the gaffe-sized hooks which will hold listeners dearly to â€œCholo Vastâ€ for all of the song’s four minutes and fifty-five seconds. There’s disillusionment everywhere in this song cut with cold comforts and intimacy but somehow, rather than amounting to a grand put-off â€“ Strummer manages to keep listeners engaged and maybe even win them to the side which thinks this song tops the list of great songs that Strummer wrote â€“ and that includes the best he did with The Clash. Going front-to-back with this single, listeners will realize how genuinely tragic it is that the â€œGangstervilleâ€ single went so horribly overlooked when it was new. Truly, these four songs qualify as classics which belong along side the platinum-covered fare of The Clash, but they aren’t regarded as such and likely never will be. It’s a shame but, happily, a few lucky store-goers will have the chance to pick up a copy of this reissue to treasure on April 16 at their local independent record store. That’s the hope and the point is that it may have taken entirely too long, but this single both needs and deserves discovering. The “Gangsterville” 12” single will be released in limited numbers on Record Store Day 2016. To find your copy, visit your local independent record store with fingers crossed!